How are you doing ladies? What are you up to these rainy days? I'm stuck at home because of the weather. I wish tomorrow is sunny so I can go out to buy a magazine. Anyhow, let's all check the covers of magazines for this month's issue. Preview with Anne Curtis. I like this girl. She's not a good singer, but an excellent actress and host. Her hair, makeup, and dress look very glamorous. 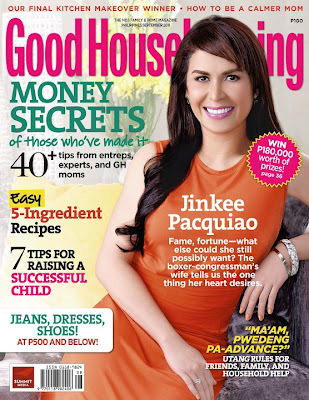 Good Housekeeping with Jinkee Pacquio. I think I'm going to purchase this issue. The contents are interesting enough to read from cover to cover. Women's Health with Lovi Poe on the cover. Did she gain a little weight or this was just photoshopped? I remember she got thinner HERE. 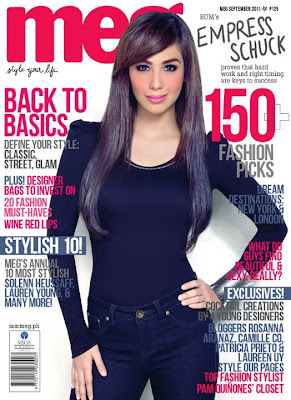 MEGA with Bianca Gonzales on the cover. The makeup is good, but I don't like her outfit.The caption says she wore pieces from a local designer and the photo was shot in Russia. Hmmm? Meg with Empress Schuck. I saw this young actress in person during the Paris Hilton Meet and Greet and girl, she's pretty. Mind you, I will buy her magazine if I were a teen. Haha. 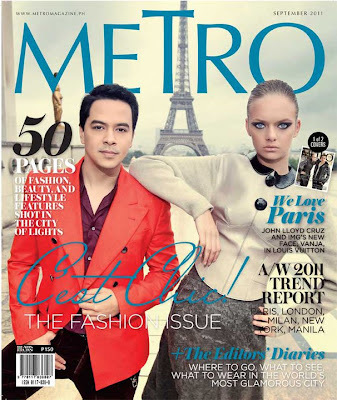 Metro with John Lloyd Cruz and Vanja Maria of IMG models. 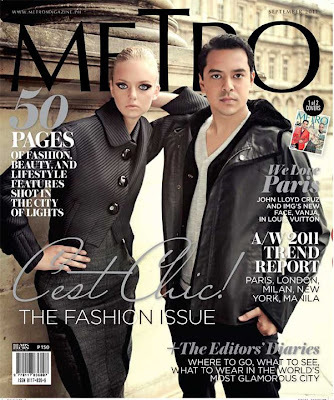 Shot in the streets of Paris, this special issue with models wearing Louis Vuitton doesn't appeal big time to me. How about you? Cosmopolitan with Phil Younghusband of Azkals and the newly wed Kim Kardashian on the cover. I don't think I'm also getting a copy of this one. Well, except if they'll give me a free pass to Cosmo Bachelor Bash 2011. Haha. That's all for now. The BER months just arrived. Aside from the holidays, I'm sure a lot of exciting things are coming from this month and beyond. In my family and friends alone, there are more or less 10 people who will be celebrating his birthday. My daughter, brother, step sister, brother-in-law, uncle.. the list goes on. I also have cool blogger events already scheduled in my calendar. Yay, can't wait! Grabe, parang ibang-iba yung mukha ni Jinkee and Empress since the last time I saw them on TV. And that's saying something since it's been months since I last watched the telly.